Geneva launches portable radios and updates Model speaker range | What Hi-Fi? It’s been 11 years since the launch of Geneva’s original Model range of wireless speakers, and only two since its Model S Wireless DAB+ scooped a What Hi-Fi? Award. Since then, the company has turned its eyes to (and caught ours with) the Geneva Model Cinema soundbase and wireless speakers from small (AeroSphere Small) to large (AeroSphere Large). However, it’s time to wave goodbye to those and say hello to the company’s new line of more affordable products aimed at a wider audience. The relaunch of the range, now named its ‘Classic’ series, comprises S, M and L models, and sees a complete technical upgrad, as well as a new walnut finish – adding to the company's signature lacquered red, black or white finishes. Headline features include Bluetooth wireless streaming, DAB/DAB+/FM radio reception, 12 radio presets and touch controls. The Classic S features a 25mm tweeter, 10cm woofer and bass port, and is available in lacquered white, red or black (£280), as well as walnut (£300). The Classic M, meanwhile, doubles up on those drivers and costs £370 or £430 for the respective finishes. A matching M brushed aluminium stand is £165, with a larger version (for the Classic L) priced at £300. Speaking of which, the Classic L is the flagship model, with four digital amplifiers driving two 25mm tweeters and two 13cm woofers, and will set you back £1200 (or £1350 for walnut). 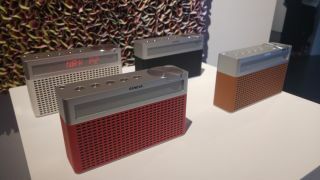 Geneva has also launched the Touring S: a portable, Bluetooth-toting, FM/DAB+ radio with six presents and up to 20 hours of playback. Adopting a retro design with an aluminium top and leather bottom, it features an LED display, and a 3.5mm jack for wired listening. The Touring S comes in four colours – red, black, white or cognac (tan) – and is available now for £170.